Lara Croft is back on the big screen, but how does the new film compare to the 2013 video game reboot? We highlight five key differences. Another day, another reboot. This time, it’s Lara Croft, the video game adventuress and raider of tombs first personified on the big screen by Angelina Jolie, who gets a fresh start with Alicia Vikander taking over the titular role. The new “Tomb Raider” film draws heavily from the 2013 video game reboot, and fans of “Tomb Raider” and its sequel, “Rise of the Tomb Raider,” will be pleasantly surprised at how many details actually make it into the film. Unlike her predecessor, Vikander sports Lara’s updated look: a gray tank top and cargo pants. She also arms herself with a bow and a quiver filled with arrows, as well as a red grappling hook, all weapons which Lara uses in the video games. The plot is also pretty similar to the events of the 2013 game, with Lara fighting her way off of the mysterious and isolated island of Yamatai. 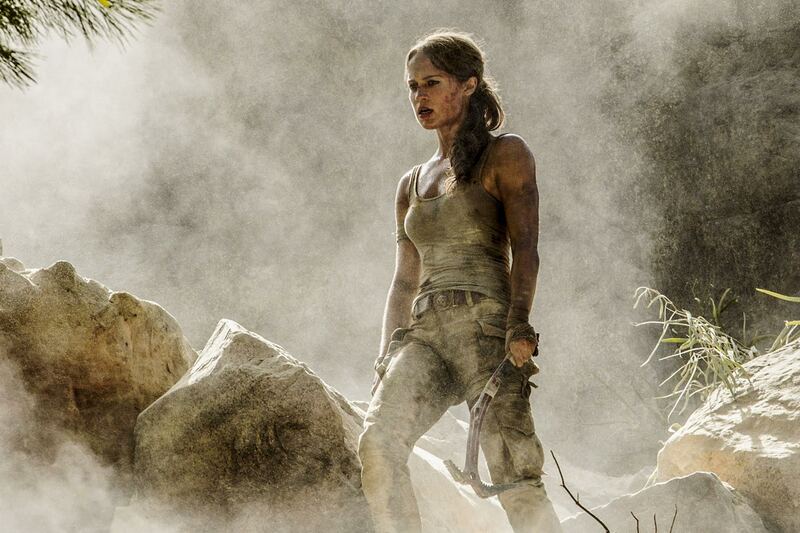 But, as with any big screen adaptation, “Tomb Raider” has made some significant changes from the video game series. And while the film is surprisingly faithful, here are five key differences between the film and the 2013 video game it took inspiration from. Beware, spoilers ahead! In the 2013 game, Lara sets off on her first big expedition in search of the lost kingdom of Yamatai. The expedition is led by a celebrity archaeologist, Dr. James Whitman, and the group also includes Conrad Roth, Lara’s mentor and close family friend, as well as her friend Sam Nishimura, whose family has not only funded the expedition, but who also are also descendants of the people of Yamatai. Although she is not leading the expedition, it is Lara’s research that has led the group to find Yamatai and her theories that have convinced the Nishimura family to fund the expedition. In the film, the audience is given multiple flashbacks which show a younger Lara, at various points in her childhood, seeing her father going off on trips. Although Lara didn’t know it at the time, Richard Croft (Dominic West) was having his own adventures under the guise of running the Croft family business, something Lara has never done herself. She also admits she never went to university, and the research that eventually leads her to Yamatai is not her own, but her father’s work, which she uses to track him down. Lara doesn’t gather a team for the trip, but instead pairs up with a young fisherman, Lu Ren (Daniel Wu), whose father had taken Richard to Yamatai seven years prior, for her fated journey to the fabled island. Lara does meet Mathias (Walton Goggins) on the island, but instead of being the leader of the Solarii Brotherhood, he is heading up the search for Himiko’s tomb under the instructions of Trinity. In the video game, once Lara and her team make it to Yamatai, they discover that the island isn’t deserted but has been taken over by the Solarii Brotherhood, a violent cult made up of criminals, mercenaries, and shipwreck survivors. The Solarii Brotherhood worship Himiko, a queen who once ruled Yamatai. Himiko was known as the “Sun Queen,” and according to legend she was given powers that gave her control over the weather. The game plays up Himiko’s supernatural powers, which are invoked by the Solarii and often keep shipwrecked sailors and anyone who comes to the island (it was used by U.S. Marines and the Japanese military for projects in the past) stranded there indefinitely. The Solarii eventually kidnap Sam for a fire ritual which will determine whether or not she is Himiko’s successor. When Sam survives the ritual (courtesy of a supernatural gust of wind), the cult aim to transfer Himiko’s spirit into her body, which would destroy her soul in the process. In the film, Himiko is introduced as a legendary Japanese queen who was nicknamed the Queen of Death. According to legend, Himiko was unstoppable and could spread death with just a touch, and was only foiled when her own generals plotted against her. Himiko was buried on Yamatai, and the location was kept hidden away, unplotted on maps and nearly unreachable due to stormy seas and a rocky coastline. Lara’s father, Richard, discovered the location of both the island and the tomb, which is said to hold supernatural powers that could have a devastating impact on the world. Mathias and his team of mercenaries have been stuck on the island for years trying to locate the tomb until Lara washes up with her father’s research, which leads them directly to it. Unlike the video game, what actually lies in Himiko’s tomb isn’t supernatural at all, but still could destroy humanity nonetheless.